A series of 12 webinar training sessions offered once per week, with 60 minutes of lecture and 30 minutes of question and answer. Classes will start the week of July 9, with the schedule to be announced. All sessions will be recorded and made available for viewing or download in the member area. The Internet Marketing for Architects Course is your key to developing an effective strategy and platform for your online promotional efforts. You’ll have a roadmap and a system that will give you the best results possible in the shortest period of time, bringing you more visibility, traffic, leads and ultimately more clients and projects. More and more of your potential clients are searching on the internet to find an architect to design their new house or commercial property, or plan a remodel or extension. Are they finding you? Not yet, if you’re like most architects who haven’t learned the smart ways to increase their online visibility. This program will give you the step by step guide to getting your WEBSITE and PORTFOLIO new visitors from the first page of search engines. If you increased the number of visitors to your website in an average month by 150, and 10% of them contacted you for work, that’s 15 new leads every month. What increase in revenue does that equate to for you? These are the type of results that I want you and your business to receive with this training. Marketing yourself online is just like using a CAD program, it’s simple when you have good training. Just like my ArchiCAD tutorials, you get the same simple step-by-step audio and video guides that show you the process. With this special live training, you’ll be able to ask questions, learn tips and master shortcuts that will save your architectural firm time, money and headaches. Before launching this program, I put these methods to the test with 8 local architectural firms from the U.S., U.K., Costa Rica and Thailand. 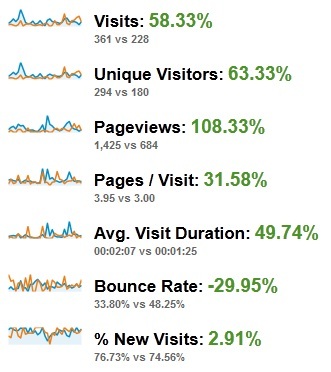 Here are REAL website statistics from one of the participants in our marketing test group after just 8 weeks of using these techniques. 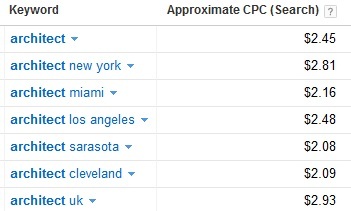 This is a screen shot as reported in their Google Analytics account. Visits – A 58.3% increase in site visits (from 228 the previous month to 361 this month) – more visits means more potential customers. Pageviews – A 108.3% increase in the number of pages viewed by site visitors (from 684 to 1,425). More page views means the information provided on the site is truly helpful to visitors, and the longer a visitor stays on the site and the more pages they view, the more likely they are to become customers. You’ll be given the exact same blueprint that helped increase visits by 58.3% for this participant. If you need more eyes on your website and portfolio, then this information is perfect for you. 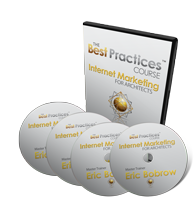 In the Internet Marketing for Architects Course, you’ll learn how to get clicks from Google, Yahoo, and Bing without paying for additional cost-per-click advertising. This can save you hundreds of dollars each month as your competition will be paying up to $3 PER CLICK just to have someone look at their website. You’ll be getting the same visitors to your website just by implementing the marketing practices you learn in this program. B. Social Media – Facebook, Twitter, Pinterest, etc. ~ Tweak your pages or blog posts and see the SEO score go up! An expert review of your current website, with specific suggestions for search engine optimization and improving site navigation and conversion. This will give you a clear picture of the most important things to change to help your online performance. Provided as a Google Document with detailed notes, as well as a recorded video tour with audio comments. 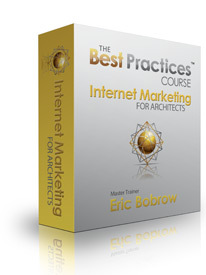 “Recently, our firm joined Eric Bobrow’s Internet Marketing For Architects training program. After the second webinar session, we found ourselves wondering how we did our marketing without him. Eric’s training is clear, informative, practical and well-prepared.